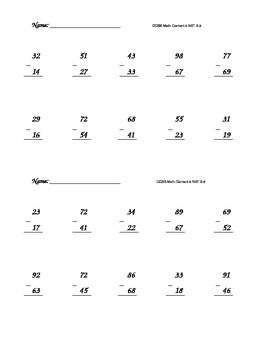 This is a page of two quick assessments for two-digit subtraction. The sheet is meant to be cut in half, with 10 problems on the top and 10 on the bottom, although you could easily give all 20 at once for a longer quiz. It is a very basic quiz, simply meant to assess students' progress on the second grade math Common Core standard 2.NBT.B.5. Erin Linde by 2 digit subtraction quiz is licensed under a Creative Commons Attribution-ShareAlike 3.0 Unported License.